Business intelligence (BI) tools are capable of working with healthcare data in an efficient manner to generate real-time information and knowledge relevant to the success of healthcare organizations. Further, BI tools benefit healthcare professionals making critical decisions within hospitals, clinics, and physicians’ offices. Applying Business Intelligence to Clinical and Healthcare Organizations presents new solutions for data analysis within the healthcare sector in order to improve the quality of medical care and patient quality of life. 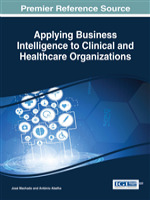 Business intelligence models and techniques are explored and their benefits for the healthcare sector exposed in this timely research-based publication comprised of chapters written by professionals and researchers from around the world. Hospital administrators, healthcare professionals, biomedical engineers, informatics engineers, and students in graduate-level healthcare management programs will find this publication essential to their professional development and research needs.